Sciblogs | What Archaeologists are doing in Christchurch – additions welcome! What Archaeologists are doing in Christchurch – additions welcome! I thought it would be interesting to review some of the activities that archaeologists and conservators have been involved in within Christchurch this past week. This information has been collated from a variety of sources, if there is any misrepresentation or inaccuracies please let me know. If there anything to add to this, it would be great to hear it. Since the beginning of the recovery period of operations it has been noticeable that a more business like tone has been given to reporting. So what is happening? CCC Media Release, March 14: a total of 837 protected heritage buildings in Christchurch have been assessed since the 22 February earthquake. Of those, 338 have received red placards, 24 of which have been approved for deconstruction. Like it or not, lists allow for accountability, and give people a sense of the current state of affairs. The Rebuilding Christchurch website also seems to be a good source of information regarding the sceduling of heritage deconstruction. It is inknown if it is being updated regularly. Since the earthquake in September 2010 there has been emergency provisions in place to speed up the authority process (the permit required to modify, remove and investigate protected heritage and archaeology). The emergency authorities allow the deconstruction of built heritage for the reasons of safety, but does not allow for any sub-surface investigations. Once deconstruction or demolition is complete, a new authority is required to establish the presence and condition of sub-surface remains. Information to inform the authority process is being collated by heritage specialists, engineers, council members and archaeologists, such as those with NZHPT. This is likely to occur when decisions regarding rebuilding are made. Current authorities being issued are to allow deconstruction/demolition. In the cordoned area within Christchurch city and outside the process of deconstruction is underway. The deconstruction phase of works is to ensure that sections of buildings considered unsafe or unstable be removed. It is understood that the fabric and materials from the heritage buildings being deconstructed are being labelled, piled separately and retained for potential later use. Demolition suggests complete removal of a heritage building. 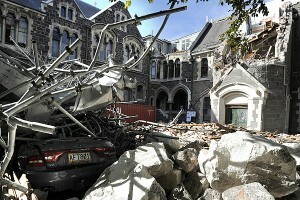 Some buildings have been assigned to demolition, such as the Time Ball in Lyttleton. See the Rebuilding Christchurch Website. This is standard practise on any archaeological site or area of significant cultural or heritage value where a digging machine is used to remove overburden, non-archaeological layers or disturbed material such as building collapse. Recording through photography is conducted, with survey to enable location of the feature/building being monitored. If safety allows, sampling of the fabric, building materials or artefacts may occur. 2 archaeologists have been employed by New Zealand Historic Places Trust to monitor the deconstruction of the heritage buildings. Above: An image of the South Quad of the Arts Centre after the Observatory tower collapse. This is a good example of the working conditions archaeologists are in, and some of the difficulties of monitoring and recording the heritage. Thanks to Bridget for the photo. Basic recording includes photography, written descriptions, location or survey. Recording associated with the preservation or conservation of heritage buildings. This may include condition assessment, drawings, survey, scanning and sampling. Sampling preserves the knowledge of the original materials, allowing for possible future elemental analysis and reconstruction with like materials. Likewise, saving the original materials during deconstruction enables later reconstruction. There is international precedence where intact buildings can be deconstructed and labelled to reconstruct in the same way in the future. This is occurring where the fabric of heritage building are being retained (see above). Recording associated with the conservation of artefacts is also occurring. The time capsules, 1 glass bottle and 1 copper alloy tube, are currently being curated by the Christchurch Museum. A paper and an objects conservator will be responsible for the stabilisation and treatment of the capsules and their contents. It is understood from the museum website that the copper alloy capsule remains unopened. When a site or building has been affected beyond repair, and cannot be saved, digital methods of recording can generate virtual reconstructions of buildings and sites . Prior to building or site demolition/deconstruction, recording using lasers in 2-d and 3-d can lead to 3-d visualisation creation. The building no longer exists, but virtual reconstruction enabling people to walk about the interior and exterior through computer use. At present, remote sensing Lidar and 3-d scanning equipment are heading to the Time Ball in Lyttleton to record this iconic building before its demolition next week. Perhaps soon we can all walk around and inside the building with the use of virtual technology and visualisation. Other methods of recording and technology exist in archaeology but these have been identified as most relevant in this situation. This is also not an exhaustive list of archaeological activities occurring at present. Any additions or relevant comments are welcome! I am an architectural designer so I will happily admit to being out of my depth here. Though I have rarely been able to practice in the area, I have long been interested in the heritage value of our built environment and the irony that our most at risk buildings are the ones that we seem to have the poorest records of. It’s sad that it has taken an event like this to spur on efforts to properly record important heritage buildings like the Time Ball Station, and even now it is possibly too late to get a complete model of this building. Now days even in my “one man band” practice, I can have a reasonably detailed 3d model of an existing building up and running fairly quckly – certainly enough to recreate the building if necessary. If history has taught us one thing, surely it is that you can never have too many records, and the more accessible the form, the better.Â In the archeology world, what are the barriers to recording buildings properly before it is too late? Apologies for this very late reply Geoff. I see from your address that you are very local to me! Thanks for the support and interest. It is an event that I did not think I would have as much to say on, and have defintiely not wanted to come across as a zealite in a time of stress. With regard recording, you are absolutely correct in that if you are going to loose something…record it. But, I do think the recording strategy has to based on or informed by the desired end product. There is no good recording for the sake of recording, if it is not going to be archived, made available, or be turned into something else in the future, ie a 3D model, a reconstructed building. The main barriers to my mind, for archaeology is the funding, lack of vision, lack of experience and fear. To preserve history in a modern format, with modern relevancies is a big task. Luckily there are many people out there in this world that have a huge swath of experience in this. In this day of accountability, funders and government want to know why and how the money is being spent and what the outcome will achieve. Sometimes it can be hard to articulate that about history or archaeology without sounding very ‘socialist’…good for health of society, connection to the land, nationalism and identity. But archaeologist should perhaps change thir language style to ‘the economy needs heritage values because it brings tourists with money, increased national pride and identity leads to a decrease in crime’ etc etc. In a natural disaster barriers also take on a more physical nature. Access and safety predominate. But scanners can be located far from a building, awareness of your surrounding is essential…basic health and safety practise. To finish Geoff, in an ideal world where money was infinite, the recording of standing heritage and archaeology would be a proactive rather than a reactive process. Record building before anything happens to them…but start with the ones in landscapes of instability!